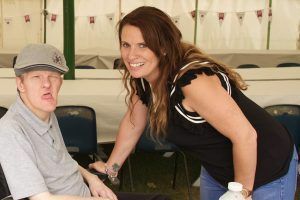 Affinity Trust has supported Patrick, who lives in a village in Cambridgeshire, for more than 10 years. From an early age, Patrick had had a keen interest in karate. Samantha now trains three times a week – flexible working allowing her to train around work commitments – and takes part in competitions. 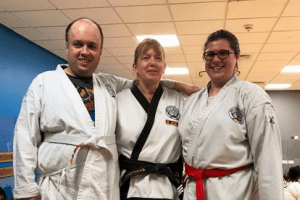 Samantha found out about Patrick’s passion for karate and supported him to take private lessons, starting in March 2018. His confidence grew and he was able to start mainstream classes in St Ives in November. 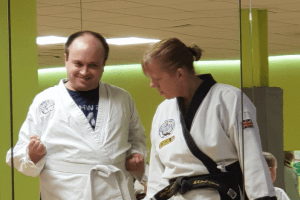 Samantha says: “Getting involved in Tang Soo Do has definitely changed Patrick’s life for the better. “It’s made him a more confident person. Before, if we were out in the community, he would have stuck to the side of his Support Worker. Now he will go ahead and will pay for his own shopping, it’s really great to see. She adds: “Patrick’s instructor is amazing and he really has so much respect for her. We can talk to her before the class and explain for example if anything has happened in his week that the class could support. What’s next? Patrick is hoping to get his first grading late in 2019. Before that, there will be an all-day seminar in Cherry Hinton in April, attended by over 100 students. The Care Quality Commission has rated Affinity Trust’s operations in Cambridgeshire as ‘Good’, with an ‘Outstanding’ rating for their responsiveness.